This time however, it was different. The killings and the crucifixions were bad enough, but worse was to follow…much worse. A Tube train disaster unleashes an evil which results in a spate of killings and horrific violence. It all seems linked to an archeological discovery underground. Can the evil be stopped? 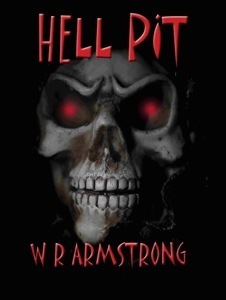 I loved the way this horror started out and I was thirsty to know more about this hell pit that had been discovered. McGrath is a brilliant character and there is some gore here which makes your hair curl but I was left wanting. I wasn’t spine chillingly afraid through this. I was hooked into the pagan lore behind it and I wish the author had expanded on this a bit more. Reminiscent of The Dark by James Herbert I loved the concept of this book but wasn’t frightened like I wanted to be. The gore and descriptions of it were in keeping with the genre but where was the frightening anticipation and the blood curdling sinister details of how the pit came to be? We knew the basics but I wanted to hear more about the individuals in the pit and the organisation behind the zombies. I do hope we see McGrath back as I think he is a wonderful character with potential. In summary I liked the book but was left wanting more.